In the Jewish War in 66-70 CE, 97,000 Jewish people were enslaved. The Emperor Vespasian brought 20,000 Jewish slaves to Rome after the Romans destroyed Jerusalem and the Temple. 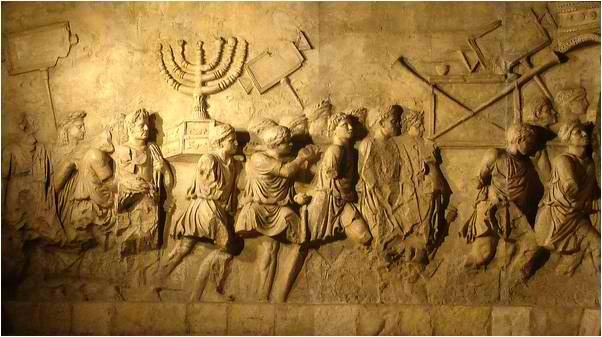 The Arch of Titus depicts a menorah as part of the plunder from Jerusalem. 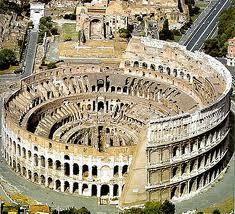 Vespasian and his successor Titus used the slaves to build the Roman Coliseum. According to a reconstructed inscription found on the site, “the emperor Vespasian ordered this new amphitheatre to be erected from his general’s share of the booty.” This is thought to refer to the vast quantity of treasure seized by the Romans following their victory in the Great Jewish Revolt in 70 AD. The Coloseum can be thus interpreted as a great triumphal monument built in the Roman tradition of celebrating great victories, placating the Roman people instead of returning soldiers.